Read the latest Hypnosis research how hypnosis can influence processes that promote healing, behavior, attitudes, perceptions and emotions in cancer patients. National Institutes of Health Panel (NIH): Definite evidence for hypnosis in alleviating chronic pain in cancer. Announcing the initiation of an exploratory, randomized controlled interventional study to evaluate the effects of Clinical Hypnosis on the immune system of cancer patients suffering from pancreatic cancer (PaCa). This small, exploratory study will enroll up to 21 cancer patients suffering from pancreatic cancer in a 2-week (2 sessions, 1 per week) study starting January 28, 2013 and concluding on February 11, 2013. Please visit Werner’s Project Page on RocketHub.com for a short video on how you can get involved in this project. The purpose of this research is to examine clinical hypnosis, a mind-body medicine modality, and its impact on the immune system via quantification of cytokine Interleukin-1beta (IL-1β) as it pertains to cancer patients afflicted with pancreatic cancer. This project is being conducted by Werner Absenger, M.Sc. who is a graduate student of Saybrook University, San Francisco, California, as part of MBM 5551 Doctoral Research I, which serves as a pilot study for dissertation research. Because of a lack of tests for early cancer screening of the general population, roughly half of pancreatic cancer patients are diagnosed at a late stage. Unfortunately, the median survival rate for advanced pancreatic cancer patients is six months, in comparison to two years for pancreatic cancer patients who were able to undergo surgery (National Cancer Institute, 2010). Clinical hypnosis and guided imagery have been shown to affect a person’s immune function. This project will examine clinical hypnosis(CH) and its impact on the immune system as it pertains to a person afflicted with pancreatic cancer. 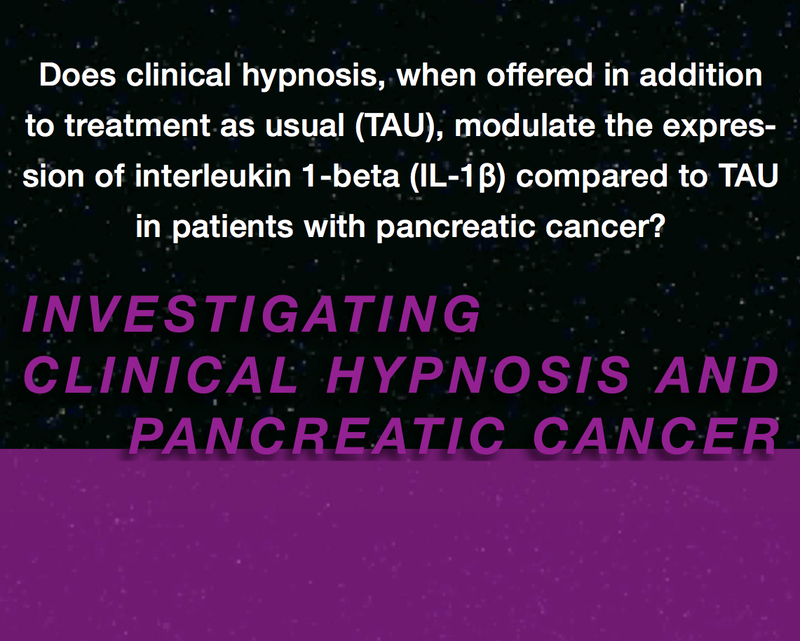 Aim: Through an exploratory, randomized controlled study the effects of clinical hypnosis on the immune system of patients suffering from pancreatic cancer will be investigated. Challenge: To quantify immunological response via the pro-inflammatory cytokine IL-1β in research participants diagnosed with pancreatic cancer undergoing clinical hypnosis intervention. Impact: Evaluation of clinical hypnosis in patients suffering from pancreatic cancer will provide preliminary data, whether or not clinical hypnosis might serve as an adjunct therapy impacting the immune system of patients suffering from pancreatic cancer. This will provide initial, early stage evidence for clinical hypnosis as an integrative cancer treatment. According to the National Center for Complementary and Alternative Medicine (NCCAM, 2012), as many cancer patients seem to seek refuge in complementary and alternative modalities, evidence-based integrative therapies are sorely needed for adjunct cancer therapies after diagnosis with metastatic cancer. The study titled “Does Clinical Hypnosis, When Offered in Addition to TAU, Modulate the Expression of IL-1β Compared to TAU in Patients with Pancreatic Cancer?” will add to existing scientific body of Mind-Body Medicine while participants may gain a greater personal awareness, knowledge, and understanding of clinical hypnosis and pancreatic cancer. Where: Spring Lake District Library, 123 E. Exchange Street, Spring Lake, MI, 494546 Please contact Werner to reserve your space. The study proposal underwent review at the Saybrook University Institutional Review Board, Saybrook University, 747 Front St., 3rd Floor, San Francisco, CA 94111-1920.